You are not logged in. [Log In] Weatherzone » Forums » Weather » General Weather » AGW theory seems to be fatally flawed. #44980 - 14/03/2008 17:46 Re: AGW theory seems to be fatally flawed. And those people would be scientists funded by oil lobby groups to question AGW? Or mainstream scientists funded by governments to do research. Or promoters of new green technologies to solve our greenhouse problem. Or the media looking to sensationalise everything by making it sound a million times worse than it really is for excitement. Or giving air time to skeptics not because they have something worthwhile to say, but because the controversy increases ratings. #44981 - 14/03/2008 18:11 Re: AGW theory seems to be fatally flawed. Sigh - Interesting times we live in. #44982 - 14/03/2008 18:18 Re: AGW theory seems to be fatally flawed. on solar: What is inconsistent about allowing solar to have an influence on climate, that is small compared to the Co2 influence over the last century? I don't deny the solar influence. Now if some skeptic were to say that consensus science claims solar influence is X, and Co2 warming was Y, but our studies show that solar influence is really 3X, then the debate becomes more interesting. It would get very interesting if they could show that the past temperature record could not be made to fit with a CO2 warming of Y and a solar warming of 3X. This seems to the approach that Svensmark has been attempting, and to date he has been trying to show the 3X part. As for an explanation for the cooling in January this year? Certainly not co2. Seems rather big for enso - none of the other la nina episodes in the last 30 years caused such a drop. And I don't know much about the details of solar, but I seriously doubt it could cause a drop of that size in such a short period. So maybe solar/enso conditions might account for say 20 or 30% of the drop, and the rest is random noise. If the rest is random noise we should expect the temperature to warm up by say at least 0.3 degrees within the next 3 or so months. Personally I was surprised that February was as cold as January. A few more months like this and I will definitely be doing some more searching for explanations. #44983 - 14/03/2008 18:29 Re: AGW theory seems to be fatally flawed. I was close to just telling myself its not worth any further discussion. But anyway, 20 cm for the last century is a very small sea level rise. The charts you have shown have shown natural variation from year to year above this value. I don't think its suprising that no trend is visible to the eye - the data is shown over 20 years. If you spread 20cm evenly over last century this is 4cm in 20 years. With a 50cm variation, this 4cm could be quite hard to spot. You could do a linear regression on the data to be more definitive. But I'm willing to take the other paper that Spiceman linked to on face value. This paper observed a 6.9mm a year trend at Tuvala. And I certainly wouldn't be looking forward to whatever sea level rises AGW may deal out in the future. #44984 - 14/03/2008 19:01 Re: AGW theory seems to be fatally flawed. Seems rather big for enso - none of the other la nina episodes in the last 30 years caused such a drop. And I don't know much about the details of solar, but I seriously doubt it could cause a drop of that size in such a short period. I'm on exactly the same page... And that sub-surface warm-pool in the West Pac is (as you may have noted in my posts on the ENSO thread) a real issue. Still scratching my head - but I have some ideas. But back to the crux of the argument - "consensus" science says solar influence on long term climate (as currently undestood) is negligible - certainly not in the 20-30% range you suggest. More like 3%. My last post on the ENSO thread suggests that, given the state of the Atmospheric Angular Momentum and the fact that there is a loose correlation with ENSO and the GLAAM, that ENSO will strenghten in three / four months. And climatologically this is the period that La Ninas typically strengthen. History is on my side. It's early days, but if temperatures don't warm up by that 0.3C as you suggest and go down as the GLAAM / ENSO / Global Temp correlation suggest - there will be a big chink in the GHG argument. This cooling WILL NOT be explainable by current CO2 / GHG primacy consensus theory. And this in turn will suggest that solar effect (direct or indirect) may be in the 3X range. Not discounting the possibility that of course something else is in play. #44985 - 14/03/2008 19:17 Re: AGW theory seems to be fatally flawed. Where is the get 6.9mm /year? Over the record time, you should have an increase of 10cm! Why is not the full record set posted? Cherrypicking! #44986 - 14/03/2008 21:40 Re: AGW theory seems to be fatally flawed. Arnost, I was looking for a full record set but couldn't link the image in here from the pdf file, but the full set is on the BOM pdf link I posted. John Daly died a year or two ago now and his article was from several years ago (I think 2001) from memory so to be fair at the time it was probably the full set available to him. and yeah, I'm confused as to the 6.9mm per annum... it's doesn't seem to be in the record that would amount to a statistically significant trend.. perhaps this is a corrected figure of some kind. #44987 - 14/03/2008 21:42 Re: AGW theory seems to be fatally flawed. Mike re your 5.46pm post I agree wholeheartedly... it will also be interesting to see what happens with the recent two months cooling and if it continues or not. #44988 - 14/03/2008 22:27 Re: AGW theory seems to be fatally flawed. So do I . As I said earlier , that FEB should have a close cooling "trend " as JAN . Its obv now , that even next 2 months will do the same . Just considering the albedo from the extra snow cover over parts of Northern H which will take at least 4 weeks longer to melt then in a normal year . There we go , a warmest winter in Sweden in 200 years , true , but it resulted in record snow falls . Like parts in Canada , record snow falls since 1966 . And so on . Prob this summer in Europe might be like , "what summer " . Just a guessing game , but all points to that . #44989 - 14/03/2008 22:52 Re: AGW theory seems to be fatally flawed. Well I think I can see upward trends for the min and median line on page 23. But I can't spot it for the max. Dot point 3 on page 2 states a raw trend of 6.4mm/year, adjusted for barometric pressure 5.7mm. Also mentions a nearby gauge with longer history but suspected lower accuracy shows 0.9mm/year. Later on the doc mentions a trend at Samoa of 6.9 - I did quote the 6.9mm from memory rather than looking it up which was a little careless. If 5 or 6mm is the real trend at Tuvula and not an error due to too short a time period, then this is nearly double the global warming trend quoted in the same paper on page 17. So roughly half of the sea level rise there must be due to other factors such as plate techtonics etc. Page 13 shows results for several different islands, mostly ranging between 2 and 7 mm a year. #44990 - 14/03/2008 23:13 Re: AGW theory seems to be fatally flawed. The very dramatic drop in late 2007 which had some of us speculating about tipping points and accelerating ice melt has been reversed with a large increase in ice area. The recovery is still only to a level that was typical around 2003. And I would assume that there would be a lot of new ice which would be more vulnerable to melting next time we have a warm summer. If snow on land has followed a similar trend then the level of snow would provide the same amount of albedo cooling as in 2003. I had a google search for snow cover trends, but didn't find anything up to date. #44991 - 14/03/2008 23:38 Re: AGW theory seems to be fatally flawed. I was going to leave the sea-level thing alone and considered it a done deal. Good old John Daly, may he RIP, he still has valuable contributions to make! The “authorative” BoM Pacific Country Report on Tuvalu doc from 2006 has this to say with respect to Tuvalu. The sea level trend to date is +6.4 mm/year but the magnitude of the trend continues to vary widely from month to month as the data set grows. Accounting for the precise levelling results and inverted barometric pressure effect, the trend is +5.7 mm/year. A nearby gauge, with a longer record but less precision and datum control, shows a trend of +0.9 mm/year. I’ve added a trendline in the max sea-level where this trend (10cm over the period) is most apparent. Digging through the detail of the “authorative” BoM doc – you will find on page 17 the exact TOPEX / JASON graph that David J has been throwing up on this thread… So it appears that he is all over this… Yes David J? And here’s what the “lookee here” is about. The record on the John Daly site for Tuvalu goes back to 1973. There is some mucking about with scales – but otherwise a perfect match across the coincident years. It is unambiguously evident that data pre-1994 exists. It therefore appears that it was intentionally omitted in order to support the “monotonic 2mm/year” data evidenced in the TOPEX/JASON altimeter record. I have added two trend lines on the above image – one that emulates the 2006 graph as above, and one that fits the 1973 – 2006 data. Readers may draw their own conclusions. So, I ask again – where is the 6.4mm/year sea-level increase headlining the “authorative” 2006 report on Tuvalu coming from? Bottom line. If one of my staff presented me with an analysis that omitted a previous data-set such as what is apparent has occurred above - and I caught them out – they would immediately face an official “please explain”. And given the evidence here – I suspect that unless they put in a truck-load more work in to the “please explain” than what is in the “authorative” doc – they would be out on their ar$e. Sorry – but analysis like this is just not acceptable. So David J – Can you please explain? #44992 - 14/03/2008 23:41 Re: AGW theory seems to be fatally flawed. #44993 - 15/03/2008 00:27 Re: AGW theory seems to be fatally flawed. January has been particularly snowy with 40 year record area of the Northern Hemisphere (see graph). February data have just been published and show a more moderate snow cover due to a warmer than usual Siberia. But in any case, snow cover since 2000 have been OVER the 40 year average. For the Southern Hemisphere, it's "worse". #44994 - 15/03/2008 07:31 Re: AGW theory seems to be fatally flawed. Arnost the data John Daley showed was not correct for land movement and was of a poor quality. The early data was from observations taken by the University of Hawaii off a rather flimsy jetty. The more recent data are from a GPS calibrated instrument which is run operationally. You shouldn't splice the data together as you are mixing good with bad, but if you want to the up-shot is there is a substantial and (probably) accelerating rising trend. As for does it matter - this is an emphatic yes. Almost alll of Funafuti - the main island of Tuvalu now floods to a depth of a few cm at king tide. Take away 20cm a flooding becomes an issue only is severe events such as cyclones. The attoll is flat as table top except for a rubble dune on the ocean side which rises to about 3m. The island has been inhabited for over 1000 years and obtained water from the fresh water lense which is now saline. I've visited the Tuvalu and sea level rise which the locals are witnessing scares them. They are living it and have experiences borne out by the science. #44995 - 15/03/2008 14:42 Re: AGW theory seems to be fatally flawed. #44996 - 15/03/2008 14:42 Re: AGW theory seems to be fatally flawed. Demesure,once again you are smoke screening. Winter snow cover variations reflect the weather rather than climate change because the snow cover is determined largely by snowfalls rather than snow melt and it remains cold across most of the NH hemisphere land during winter despite a degree of warming. The same trend is evident in OZ with a 40% decline in spring snow in the snowy Mountains. We also, both know, that french snow has declined dramatically and the glaciers in your alps are as short as anytime in 2000 years and retreating at a rate of metres per year. #44997 - 15/03/2008 15:01 Re: AGW theory seems to be fatally flawed. The Hadley Climate Unit February ( HadCRU ) number is out: it is +0.194 up from 0.056 in the previous month. Note there appears to have been an adjustment to the January temp (originally +0.037). The global temperature has increased. If the temperature continues to increase at this rate from now on, the prediction will be met easily. But note, the temp is still below the minimum criteria for the Met Office prediction to be supported. When we get a more meaningful data series (say in 4 months time) I’ll include an annualized average line and a “required average” line to meet the predicted values by the end of the year. Looking like a really interesting contest at the moment – looks like it can go either way. #44998 - 15/03/2008 16:01 Re: AGW theory seems to be fatally flawed. Thanks for the links on snow. If we look at snow anomolies for all months, it seems that snow cover is quite temporary - it can easily switch from as high as it has been in February, to negative within a few short months. Or the other way around. Also interesting to note that the data shows evidence of a step function - to me it looks like snow anomolies have been neither increasing or decreasing through the time period, except for an abrupt step down around 1987. #44999 - 15/03/2008 19:43 Re: AGW theory seems to be fatally flawed. So if there is less snow in the NH's summer, this means it's not due to Greenhouse gases increase, since this effects takes place in the troposphere and mostly in winter (because the GHG effect of water vapor dwarfs CO2 in summer). BTW, it's funny to see you using the usual trick of claiming "it's the weather" when facts don't suit you then just some lines later saying "it's climate change" when data are OK for you. Just like alarmists claiming that the Arctic ice melting is the canary in the CC coal mine but "forgetting" to mention that ice in Antarctica is growing and the global sea ice hasn't changed over the 30 years of available sat observation. In normal science, it would raise serious soul searching. In "consensus" science, the culprit is found and the debate is over. The glaciers in the Alps have been retreated at the end of the Little Ice Age, well before GHG emission was a problem. 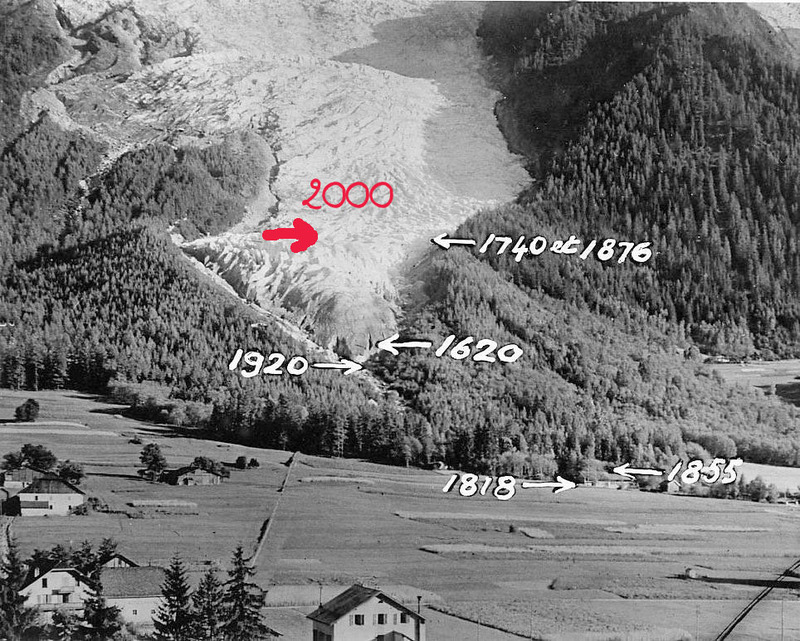 Generally, they fluctuate because they depend not only on temperature but also on precipitation and soot due to industrial pollution, like this example of the glacier Bossons (my cousin lives in the region): the 2000 level is the same like the 1876 level. GW (that I don't refute for the past 30 years) increases melting but also precipitations (the Mont Blanc summit is higher every year because of increased snow accumulation), so attributing glaciers retreat to AGW is a sensonalistic claim but it is not based on facts or sound science. Generated in 0.039 seconds in which 0.025 seconds were spent on a total of 13 queries. Zlib compression disabled.